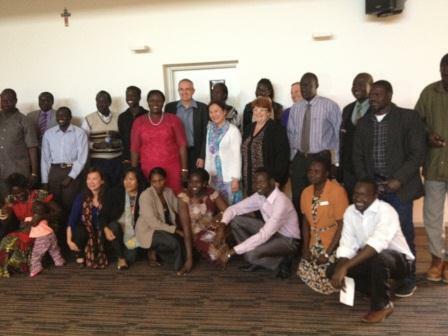 At the first gathering of the UCA’s Sudanese National Conference, held recently in South Australia, a young man told his story. Among the heart rending details of his flight from civil war was a theological insight that he was clearly passionate about. He explained that when he was growing up his community had its own god. No one else could seek their god’s help and they couldn’t have access to any other community’s god. He said that even when he became a Christian, at first he didn’t realise that other people could worship Christ. And while he gradually came to know people from other communities – thrown together by the war – as sisters and brothers in Christ, he never dreamt that people other than the Sudanese or other than Africans could all be together in Christ. His eyes shone as he looked at our gathering in the northern suburbs of Adelaide – people of many languages, different cultures, various denominations young and old, women and men, but one in Christ. He had discovered that most profound theological insight, poorly described as “monotheism”: because God is One, and all human beings are God’s creatures, made in God’s image, we are all equally valuable. Because God is One we are made to be at peace with one another. No Andrew, he had discovered Christ, and him as Saviour and Lord. I am sure you know that this is much more than ‘monotheism’.